A hotel can be a luxurious and high quality establishment where customers go to be treated like royalty and experience the finer things in life. Part of every successful hotel, however, is an equally successful kitchen. Depending on the size of the hotel, the kitchen may be quite large and complex. Understanding the elements of a high functioning hotel kitchen will improve the experience of your guests and eliminate potential problems. A hotel kitchen cannot function without a high quality, industrial-strength oven and stove. These appliances are able to generate massive amounts of heat, which is necessary to quickly and efficiently cook a large number of menu items for each meal. Accompanying the cooking appliances in a hotel kitchen are large storage units used to house the huge assortment of ingredients and food items used in hotel meal preparation. Pantry storage units may be made from stainless steel, or entire rooms may be dedicated to the storage of dry and canned goods. Typically, a hotel will feature some type of commercial refrigerator used to keep dairy products, meat, juices, and produce fresh for long periods of time. 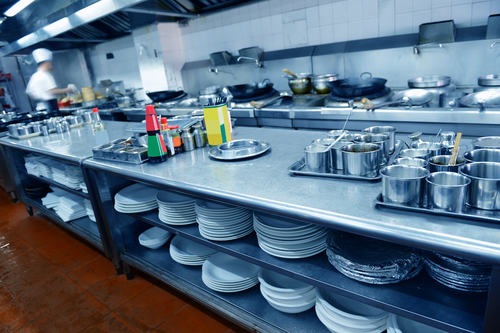 One thing that you may notice in a hotel kitchen is the abundance of stainless steel surfaces. Stainless steel work tables, appliances, storage units and other equipment is usually made of stainless steel because this material is easy to keep clean and disinfected. Because the food prepared in a hotel kitchen is served to a large number of guests, it is important that hotel kitchen health standards be perfect. While the employees who work in a hotel kitchen are not permanent fixtures like stoves or refrigerators, the organization and efficiency of these individuals is just as important to the overall function of the hotel kitchen. All successful hotel kitchens use an employee hierarchical system, so that everyone knows precisely what their job is and to whom they report. In a large hotel kitchen, there may be one or two head chefs. These chefs have sous chefs directly beneath them who are responsible for creating the key elements on the menu. Below these sous chefs are pastry chefs, chef de partie and commis chefs who each have specific cooking, ordering or food prep tasks. Then there are the kitchen porters and stewards who are responsible for everything from chopping vegetables and meat; to fetching utensils and cooking supplies; to keeping the kitchen clean throughout the cooking process. If your hotel kitchen is not functioning smoothly, it may be a good idea to take a look at the hierarchy of your kitchen staff. When everyone knows who is in charge, tasks can be delegated and completed with greater efficiency. A hotel kitchen is much more complicated and vast than a kitchen in a small restaurant or café. The appliances used to prepare meals are large and can be dangerous if used incorrectly. Stainless steel surfaces abound because they are easier to clean and maintain. A large staff must be organized effectively in order to run such a large kitchen. When you know the elements of a hotel kitchen, you'll be better prepared to direct the process of preparing a menu for a huge crowd of guests.